What Will Peace Mean for My Loved Ones in Eritrea? Eritrea - History Aside, What Will Peace Mean for My Loved Ones? PM Abiy Ahmed and Eritrea's President Isaias Afwerki. For those seeking good news from Africa, there is no better recent example than the dramatic rapprochement between Ethiopia and Eritrea. Pictures and videos of the overjoyed crowds in Asmara and Addis Ababa greeting the other country's leaders on mutual visits circulated rapidly on social media as well as in international news coverage. "We are asking things like: Will my sister in school still be conscripted into compulsory military service next year? Will my cousin, who is looking for ways to be smuggled across the border, be allowed to leave legally instead? Will my aunt, who has criticised the Eritrean government from outside the country, be allowed back in? Will my uncle, languishing in jail for political reasons, finally be released?" This AfricaFocus Bulletin, in addition to links to that article and others immediately below, includes 3 short well-informed articles by journalists Martin Plaut and Jason Burke and by Eritrean exile and human rights activist Abraham Zere. In particular, see http://www.africafocus.org/docs18/eth1804.php, "Wax, Gold, and "Ethiopianess," April 23, 2018. This week Ethiopian prime minister, Abiy Ahmed visited neighboring Eritrea, to be greeted by president Isaias Afwerki. The vast crowds that thronged the normally quiet streets of Eritrea's capital, Asmara, were simply overjoyed. They sang and they danced as Abiy's car drove past. Few believed they would ever see such an extraordinarily rapid end to two decades of vituperation and hostility between their countries. The first indication that these historic events might be possible came on June 4. Abiy declared that he would accept the outcome of an international commission's finding over a disputed border between the two countries. It was the border conflict of 1998-2000, and Ethiopia's refusal to accept the commission's ruling, that was behind two decades of armed confrontation. With this out of the way, everything began to fall into place. The two countries are now formally at peace. Airlines will connect their capitals once more, Ethiopia will use Eritrea's ports again, its natural outlet to the sea, and diplomatic relations will be resumed. Perhaps most important of all, the border will be demarcated. This won't be an easy task. Populations who thought themselves citizens of one country could find themselves in another. This could provoke strong reactions, unless both sides show flexibility and compassion. This breakthrough didn't just happen. It has been months in the making. Some of the first moves came quietly from religious groups. In September last year the World Council of Churches sent a team to see what common ground there was on both sides. Donald Yamamoto, Assistant Secretary of State for Africa, and one of America's most experienced Africa hands, played a major role. Diplomatic sources suggest he held talks in Washington at which both sides were represented. The Eritrean minister of foreign affairs, Osman Saleh, is said to have been present, accompanied by Yemane Gebreab, president Isaias's long-standing adviser. They are said to have met the former Ethiopian prime minister, Hailemariam Desalegn, laying the groundwork for the deal. Yamamoto visited both Eritrea and Ethiopia in April. But achieving reconciliation after so many years took more than American diplomatic muscle. Eritrea's Arab allies also played a key role. Shortly after the Yamamoto visit, president Isaias paid a visit to Saudi Arabia. Ethiopia - aware of the trip - encouraged the Saudi crown prince to get the Eritrean president to pick up the phone and talk to him. President Isaias declined, but—as Abiy Ahmed later explained—he was "hopeful with Saudi and US help the issue will be resolved soon." Finally, behind the scenes, the UN and the African Union have been encouraging both sides to resolve their differences. This culminated in the UN Secretary General, Antonio Guterres, flying to Addis Ababa for a meeting on Monday - just hours after the joint declaration. Guterres told reporters that in his view the sanctions against Eritrea could soon be lifted since they would soon likely become "obsolete." But the Tigrayan movement - the Tigray People's Liberation Front (TPLF) - that was dominant force in Ethiopian politics until the election of prime minister Aiby in February, has been side-lined. It was their quarrel with the Eritrean government that led to the 1998 - 2000 border war. The Eritrean authorities have rejoiced in their demise. "From this day forward, TPLF as a political entity is dead," declared a semi-official website, describing the movement as a 'zombie' whose "soul has been bound in hell". Such crowing is hardly appropriate if differences are to be resolved. The front is still a significant force in Ethiopia and could attempt to frustrate the peace deal. These are just some of the problems that lie ahead. There is no guarantee that the whole edifice won't collapse, as the complex details of the relationship are worked out. There are many issues that have to be resolved before relations between the two countries can be returned to normal. But with goodwill these can be overcome, ushering in a new era of peace and prosperity from which the entire region would benefit. The meeting of Abiy Ahmed, Ethiopia's 41-year-old prime minister, and Isaias Afwerki, the 71-year-old president of Eritrea, in Addis Ababa on Saturday left seasoned Africa observers gasping for breath. "The pace of this is simply astounding," said Omar S Mahmood, of the Institute for Peace and Security Studies in Ethiopia's booming capital. The meeting between Abiy and Isaias concluded an intense bout of diplomacy that appears to have ended one of Africa's longest-running conflicts. "Words cannot express the joy we are feeling now," Isaias said, as he had lunch with Abiy. "We are one people. Whoever forgets that does not understand our situation." Many Ethiopians expressed their exhilaration on social media. "The events of these past … days between Ethiopia and Eritrea are like the fall of the Berlin Wall. Only amplified 1,000 times," Samson Haileyesus wrote on Facebook. The reaction in Eritrea has been equally ecstatic. Analysts say such hyperbole may be justified. The bid for peace with Eritrea is just the latest in a series of efforts that may bring revolutionary reform to Africa's second most populous nation, transform a region and send shockwaves from the Mediterranean to the Cape of Good Hope. Since coming to power in April, Abiy has electrified Ethiopia with his informal style, charisma and energy, earning comparisons with Nelson Mandela, Justin Trudeau, Barack Obama and Mikhail Gorbachev. He has reshuffled his cabinet, fired a series of controversial and hitherto untouchable civil servants, including the head of Ethiopia's prison service, lifted bans on websites and other media, freed thousands of political prisoners, ordered the partial privatisation of massive state-owned companies, ended a state of emergency imposed to quell widespread unrest and removed three opposition groups from a list of "terrorist" organisations. Nic Cheeseman, an expert in African politics at Birmingham University, said Abiy's extraordinary campaign was a test of the argument that only repressive government can guarantee the levels of development so desperately needed across Africa. Despite an International Monetary Fund forecast predicting that Ethiopia, which has relied on a centralised economic model and political repression for decades, would be the fastest-growing economy in sub-Saharan Africa in 2018, even the officially sanctioned press has admitted the country's serious difficulties. "Ethiopia was on the edge of the abyss. They have realised they cannot continue in the same old way. Only an advanced democratic system would prevent the country coming to pieces and a disaster that Africa has never seen before," said Andargachew Tsege, a British citizen unexpectedly pardoned in May after four years on death row on terrorism charges. Abiy invited Tsege, who was abducted by Ethiopian security services four years ago, to a meeting two days after his release. They spoke for 90 minutes. No one claims that Isaias, the "hard and rigid" ruler of Eritrea since 1991, has much in the way of new ideas. A nation of about 5.1 million people, Eritrea is the only African country where elections are not held. As many as 5,000 Eritreans flee their country every month, notably to avoid indefinite military conscription. Many head to Europe. The economy has flatlined for decades. The UN has accused the regime of crimes against humanity. "The entire history of [Isaias] is as a ruthless Marxist-Leninist ... Enemies were shot and killed. Economically, his position has always been: we are completely selfreliant. Is this guy going to become a happy-clappy liberal? It is possible he wants to be Eritrea's Mandela but seems unlikely," said Martin Plaut, a senior research fellow at the Institute of Commonwealth Studies at the University of London. For the moment Abiy's reforms have popular support, and the crucial backing of much of the ruling Ethiopian People's Revolutionary Democratic Front, the rebel coalition that came to power in 1991. But there is resistance. Last month, a grenade was thrown at a rally organised to showcase support for the reforms in Addis Ababa's vast Meskel Square. Two died. "Love always wins ... To those who tried to divide us, I want to tell you that you have not succeeded," Abiy said after the attack. Much depends on the determination of the Ethiopian leader. Seen as a relative outsider before being picked for the top job by the EPRDF council, Abiy is the first leader from Ethiopia's largest ethnic community, the Oromo, who have complained for decades of economic, cultural and political marginalisation. The EPRDF is split by battles between four ethnically based parties as well as fierce competition between institutions and individuals. Born in western Ethiopia, Abiy joined the resistance against the regime of Mengistu Haile Mariam as a teenager before enlisting in the armed forces. After a stint running Ethiopia's cyberintelligence service, he entered politics eight years ago and rose rapidly up the ranks of the Oromo faction of the EPRDF, which has historically been at odds with the Tigrayans, who compose only 6% of the total population but have long had disproportionate political and commercial influence. In a major break with precedent, Abiy has been pictured with his wife and daughters, whom he has publicly thanked for their support. As Abiy's reforms gather momentum, the risks rise too. "Democracy can be achieved through benevolent leadership, but it can only be consolidated through democratic institutions. What we are seeing now is more of a personality-cult kind of movement," said Mekonnen Mengesha, a lecturer at Wolkite University. Like other African countries - such as Kenya and Zimbabwe just over a decade ago - Ethiopia has seen previous efforts to reform its closed, autocratic system that have not ended happily. "It's really exciting and great news, but Abiy has not done anything that really threatens the regime," said Cheeseman. "And until a government is actually faced with losing power you don't know what will happen." Abraham T. Zere is executive director of PEN Eritrea. He lives in exile. His articles have appeared in The Guardian, The Independent, Al-Jazeera English, Index on Censorship magazine, among others. In barely the blink of an eye, Eritrea's unpredictable president has completely reversed his rhetoric of the past two decades. In just a few weeks, relations between Ethiopia and Eritrea have not just shifted dramatically but - in many ways - turned upside down. For two decades, President Isaias Afwerki had demonised Ethiopia, seeing it as an existential threat. He used the supposed Ethiopian menace as a pretext to establish one of the world's most repressive regimes, ban widespread freedoms, and impose indefinite military conscription. Some of the only bits of music to get official approval from Asmara were toxic war songs that reinforced this all-encompassing enmity on which the nation's identity was based. Now, this could not have flipped more completely. 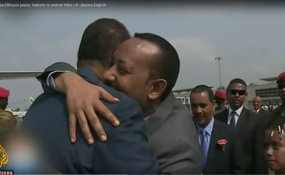 In the past month, Ethiopia's Prime Minister Abiy Ahmed and President Isaias have embraced warmly in both Asmara and Addis Ababa, greeted by huge doting crowds. Eritrean praise-singers have literally changed their tunes to praise peace in Amharic and Tigrinya. Today, the first flight between the two countries in 20 years landed in Asmara, carrying a fully-booked plane that included Ethiopia's former Prime Minister Hailemariam Desalegn. In barely the blink of an eye, full-throated enmity seems to have turned into wholehearted love - to the extent that hopeful Eritreans, whose lives have long been determined by the mood of one man, are starting to worry. Given the opaque way in which the regime governs, Eritreans are used to following Isaias' words and actions carefully in search of any hints. But for even those unaccustomed to observing him, his recent performance in Ethiopia was startlingly. He appeared out of character, praising the leader of his long-time foe excessively, and proclaiming that the two nation's populations are "one people". He then remarkably told Abiy "you are our leader" and announced happily to the crowd: "I've given him all responsibility of leadership and power". It was not long ago that it was almost unthinkable that Isaias - a man who played a leading role in Eritrea's battle for independence and based his leadership on the need to protect against Ethiopia - might one day shake hands with his counterpart in Addis. But now, some Eritreans are afraid that the president might be about to declare Eritrea reunited with Ethiopia. Petitions have reportedly been started and demonstrations called. There are claims being circulated on social media that certain army commanders have said that Isaias has compromised Eritrea's national interest and should not be allowed home. Amidst all this uncertainty, one thing that is clear is that the former status quo has been broken. So many of the regime's actions were justified by referring to Ethiopian hostility, but this pretext no longer exists. Eritreans are eagerly listening out for any signs that these moves may be coming, but the government is remaining characteristically quiet on these fronts. If it were to try to resume normal life in the country, however, it would take quite some time. Thanks to the government's short-sighted and reclusive policies for two decades, the state has been reduced to a mere shell. Institutions have been dismantled over the years and power has been concentrated into the hands of a few. Those with authority are old and incapable of overseeing dynamic change, while the country loses thousands of young people every month as they flee across the border. If Isaias is genuine in his desire for change, he could use the justification that "new blood" is needed - as he did in 1994 - to overhaul the government, removing senior officials and go after those accused of corruption. He might also place the blame for abuses and mistakes on military commanders and dispose of them. He could try to transfer power to the next generation. But he would face the problem that there is huge gap between the old and young, while decades of alienation have made most people feel like mere observers in their own affairs. Finally, even with all these changes, the elephant in the room would remain: the same capricious individual responsible for creating one of the world's most repressive regimes - involving systemic torture, the imprisonment of opponents and much more - would still reign supreme. In reality, the only way that Eritrea can meaningfully move forwards now is for President Isaias to step down after a quarter of a century in control. If he did take such a courageous step, he might be remembered for playing a positive role in Eritrea's history. Both of these things seem unthinkable. But recently, the unthinkable has been happening. Abdi Latif Dahir provides a short listing and review of five recommended books. Copyright © 2018 AfricaFocus. All rights reserved. Distributed by AllAfrica Global Media (allAfrica.com). To contact the copyright holder directly for corrections — or for permission to republish or make other authorized use of this material, click here.